Current Police Chief and former Captain Tom Foster is a 33 year veteran with the Orange County Sheriff's Office in Orange County, Florida. He was a member of the agency SWAT Team for over 20 years, holding positions as the team's Rappel Master, Counter Sniper and Team Leader. Tom is a Certified Rappel Master with a SWAT, military, fire-rescue, and civilian caving training background in: Safety Procedures and Rappel Operations, to include: Equipment Nomenclature, Preparation and Inspection, Advanced Knots, Anchors Systems, Ascending Techniques, Fast Roping, Hauling Systems, Weapons Management on Rappel, Tactical Rappelling Techniques and Helicopter Control. 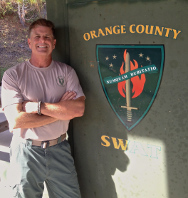 He is the lead instructor for the Florida SWAT Association (FSA), IPTM Basic SWAT School, and NTOA. He has instructed courses at the International SWAT Round-up Competition since 1999, including: "Rescue Techniques, Weapons Management on Rappel, Fast Roping, 2-4 man Window Entries, Knots and Anchor Systems". Prior to instructing at the Round-up, Tom was a competitor for a number of years. The Vertical Option School employs a cast of talented Instructors, all of which are experienced rappel masters. As a former member of SWAT and a current Instructor with the Florida SWAT Association, I am dedicated to ensuring the safety and enhancement of quality tactical rappel training and operations. My mission is simple: safety, safety and more safety for our SWAT and tactical personnel while engaged in rappelling training and operations.